" . . . perhaps he's envious of my ability to break wind while in mid air . . . "
Humans don't have the grace and style our species posses, but the Princess seems totally enthralled by dancer's attempts to appear graceful. Here I'm sure you anticipate my next confession. Waiting for the biographer's customary introduction? If the reader has endured the process of 'over-exposure' one encounters in the process of 'getting to know' The Supreme and Magnificent One, then the following information should serve only to further titillate one's curiosity for testing just how much one can actually stand. I understand David Walter's friend, Paul Bowman, plans on interviewing Warty at his earliest opportunity. Warty's calendar is filling quickly and I'd suggest that Mr. Bowman doesn't hesitate to get in line. Did I over-sleep? Ahhhhhhhh, yes. Regained my strength to go on with this gem of enlightenment. Let's see - - where was I? Ah, yes. One of the arts the Princess most admires is dance. She watches that TV thing whenever a dance-special is scheduled, she curled up on the bed with a warm cup of coffee, soft-blue eyes following every move on the screen. Humans don't have the grace and style our species posses but she seems totally enthralled by dancer's attempts to appear graceful. Here I'm sure you anticipate my next confession. While she's away at what she refers to as 'work', I, practically ignored by that other guy, practice daily, performing steps far more difficult than any human can perform. Don't raise an eyebrow. In the jungles, warthogs are celebrities when it comes to performance, and within days I'd mastered those popular and difficult steps know as River Dance (however, without making the mistake of a clumsy and most awkward final foot-tap as seen on the TV version). Of course the Princess begged to see me dance as soon as she discovered my well-guarded secret. (Someone must have accidentally let it slip that I knew the number, but I don't recall the exact circumstances. Oh well, erudite soul, she would have found out sooner or later). Anyway, you should have seen her amazed face when I first danced for her entertainment, when my footwork nearly set bed-covers ablaze! Eyes wide with wonder, hands clasped over breast, she oooed and awed while I performed the Irish jig, hoofs flashing, my jaunty leg moves a blur. Finally stopping in need of refreshment, I caught my breath and sipped coffee from her personal cup. (I'm the only one allowed the privilege. That other guy has to use his own cup). Since then, I've polished a few more moves, my dance steps leaving the other guy in a snit. Poor old man - - one can't expect much of a fellow his age. He's taken to leaving the room when the Princess asks me to dance, most likely an excuse to avoid being seen as a grudging old discontent. 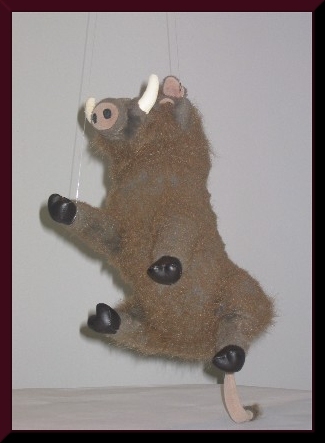 Or perhaps he's envious of my ability to break wind while in mid air, something only warthogs (other than birds) can do. Oh well, I can't let his shallow envy discourage my natural talents. I think I'll continue to learn new steps, and maybe enter some competition. Just imagine me - - the Princess in my arms, the two of us twirling and spinning across polished wooden floors, she gazing into my eyes as I sweep her off her feet in moves guaranteed to win first prize! The only thing deterring my plans is the horrid reputation of the dance judges. Those overage pompous-shirts who favor special pets; some judges, indeed! You see, I'm sure that when exposed to my genius, noses-in-the-air-judges will revert to their predictable practice of assigning one such as I some undeserved finalist's position in what would otherwise be a popular landslide win! Ahhhhhhh, but as I mentioned in the beginning, I suffer the inequities of life. My! Do you see the time! How it flashes past when you're attending my every word. You know I thank each and every one of you, though I suppose it should be you who're thanking me! Nevertheless, don't apologize at this point. I am a keenly appreciative soul. If I can only get that other guy's attention (where on earth has he gone? ), I may be able to enjoy a small evening's repast and a deserved beverage or two. Unfortunately, I've learned that I can't always count on him! Remember, no need to say 'nice things' to the biographer. I'll most likely have to hire someone to edit this work and if I have anything to say about that, he'll be the one to pay for it! However, don't forget to leave nice messages for me!